زارعی, مهدی, رحیمی, غلامحسین. (1396). تحلیل ارتعاشات آزاد پوسته‌های مخروطی کامپوزیتی مشبک. 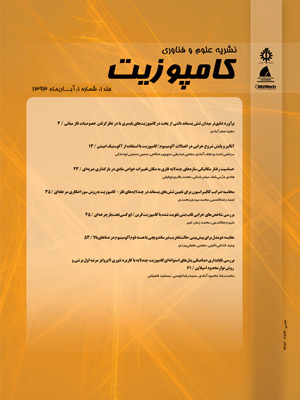 علوم و فناوری کامپوزیت, 4(1), 1-8. مهدی زارعی; غلامحسین رحیمی. "تحلیل ارتعاشات آزاد پوسته‌های مخروطی کامپوزیتی مشبک". علوم و فناوری کامپوزیت, 4, 1, 1396, 1-8. زارعی, مهدی, رحیمی, غلامحسین. (1396). 'تحلیل ارتعاشات آزاد پوسته‌های مخروطی کامپوزیتی مشبک', علوم و فناوری کامپوزیت, 4(1), pp. 1-8. زارعی, مهدی, رحیمی, غلامحسین. تحلیل ارتعاشات آزاد پوسته‌های مخروطی کامپوزیتی مشبک. علوم و فناوری کامپوزیت, 1396; 4(1): 1-8. سازه‌های مخروطی کامپوزیتی به‌عنوان اجزای تشکیل دهنده سازه‌ای در صنایع هوافضا و دریایی و مهندسی عمران استفاده می‌شوند. در این تحقیق ارتعاشات آزاد مخروط کامپوزیتی مشبک با تکیه‌گاه ساده مطالعه شده است. تاکنون مطالعه روی آنالیز ارتعاشی این گونه از سازه‌ها انجام نشده است. از روش تحلیلی- تقریبی معادل‌سازی برای معادل کردن سفتی تقویت کننده‌ها استفاده شده که در آن تقویت کننده‌ها به‌صورت تیر در نظر گرفته شدند. این تقویت کننده‌ها قادر به تحمل نیروهای برشی و ممان خمشی نسبت به بارمحوری وارده می‌باشند. مسیر ژئودزیک برای تقویت کننده‌ها انتخاب و معادلات مربوط به آنالیز ارتعاشی بر مبنای تئوری دانل استخراج شده‌اند. از روش ریتز برای حل معادلات و استخراج فرکانس‌های طبیعی استفاده شد. یک مدل سه بعدی در نرم افزار آباکوس تهیه و نتایج حاصل از تحلیل با نتایج حاصل از نرم افزار آباکوس مقایسه شد. مقایسه‌ها توافق خوبی را نشان دادند. اثر تغییر پارامترهای هندسی و تغییر در زاویه بین تقویت کننده‌ها روی فرکانس ارتعاشات بررسی شد. نتایج حاضر جدید بوده و می‌تواند به عنوان مبنایی برای مطالعات آتی مورد استفاده قرار گیرد. Laminated composite conical shells are used as components of aerospace, marine industries and civil engineering structures. In this research free vibration of grid stiffened composite conical shell with simply support boundary condition is studied. No study has yet been done on vibration analysis of these structures. Smeared method is employed to superimpose the stiffness contribution of the stiffeners with those of shell in order to obtain the equivalent stiffness parameters of the whole structure. The stiffeners are considered as a beam and support shear loads and bending moments in addition to the axial loads. Geodesic path is applied to the stiffeners. Equations were derived using classical shell theory of Donnell type and were solved using energy functional with the Rayleigh-Ritz method. A 3D finite element model was built using ABAQUS software. Results were compared and validated for grid stiffened structure with ABAQUS software. Comparisons and validations revealed good agreements. The effects of shell geometrical parameters and variations in the cross stiffeners angle on the natural frequencies were investigated.Results given are novel and can be used as a benchmark for further studies. Hemmatnezhad, M. Rahimi, G. H. and Ansari, R., ‘’ On the free vibrations of grid-stiffened compositecylindrical shells’’, Acta Mech, Vol. 225, pp. 609–623, 2014. Rahimi, G. H. Hemmatnezhad, M. and Ansari, R., “Prediction of Vibrational Behavior of Grid-Stiffened Cylindrical Shells,” Advances in Acoustics and Vibration, Vol. 2014, Article ID 242573, 10 pages, 2014. Hemmatnezhad, M. Rahimi, G.H. Tajik, M. and Pellicano, F., ‘’Experimental, numerical and analytical investigation of free vibrational behavior of GFRP-stiffened composite cylindrical shells’’Composite Structures, Vol. 120, pp. 509–518, 2015. Blom, A. W. Setoodeh, S. Jan, M. A. Hol, M. and Gurdal, Z., ’’Design of Variable-Stiffness Conical Shells for Maximum Fundamental Eigenferquency’’. Computers and Structure Vol. 86, No. 9, pp 870–878, 2008. Kidane, S.G. Li, J. Helms Pang, SS. and Woldesenbet, E. “Buckling load analysis of grid stiffened composite cylinders,” Composites part B, Vol, 34, No. 1, pp. 1–9, 2003. Talebitooti, M. Ghayour, M. Ziaei-Rad, S. and Talebitooti, R., “Free vibrations of rotating composite conical shells with stringer and ring stiffeners,” Archive of Applied Mechanics, Vol 80, No. 3, pp 201-215, 2010. Talebitooti, M. Daneshjou, K. and Talebitooti, R., ‘’Vibration and Critical Speed ofOrthogonally Stiffened Rotating FG Cylindrical Shell Under Thermo-Mechanical Loads Using Differential Quadrature Method,’’. Journal of Thermal Stresses, Vol 36, No.2, pp 160-188, 2013. Mead, DJ. and Bardell, NS., ‘’Free vibration of thin cylindrical shell with periodic circumferential stiffeners’’. J Sound Vib Vol 115, No. 3, pp. 499–520, 1987. Bardell, NS. and Mead, DJ., “Free vibration of an orthogonally stiffened cylindrical shell’’, Part I: discrete line simple supports. J Sound Vib Vol 134, No. 1, pp. 29–54, 1989. Bardell, NS. and Mead, D.J., “Free vibration of an orthogonally stiffened cylindrical shell,” Part II: discrete line simple supports. J Sound Vib Vol 134, Issue 1, pp. 55–72, No. 8, 1989. Yazdani, M. Rahimi, GH. Afaghi Khatibi, A. and Hamzeh, S., “ An experimental investigation into the buckling of GFRP stiffened shells under axial loading,’’ Sci Res Essay, No.ol 4, No. 9, pp. 914-920, 2009. Naderi, A. A. Rahimi, GH. and Arefi. M., “Influence of fiber paths on buckling load of tailored conical shells,’’ Steel and Composite Structures, Vol. 16, No. 4, pp. 375-387, 2014. Naderi, A. A. and Rahimi, GH., ‘’Buckling analysis of grid stiffened composite conical shell’’, The 12th Iranian Aerospace Society Conference Amir Kabir University ofTechnology, 2013. Naderi, A. A. and Rahimi, GH., ‘’Buckling analysis of glass fiber rienforced epoxy/clay conical shells subjected to axial loading,’’ The 12th Iranian Aerospace Society Conference Amir Kabir University of Technology, Tehran, Iran, 2013. Shanshan, Shi. Sun, Zhi. Mingfa, R. Chen, a. and Xiaozhi, Hub., “Buckling resistance of grid-stiffened carbon-fiber thin-shell structures,’’ Composites: Part B, Vol. 44, pp. 888–896, 2013. Irie, T. Yamada, G. and Tanaka, K., ‘’Natural frequencies of truncated conical shells,’’ Journal of Sound and Vibration, Vol. 92, No. 3, pp. 447–453. 1984. Lam, K.Y. and Li, H., “On free vibration of a rotating truncated circular orthotropic conical shell,’’ Composites, Part B Vol 30, No. 2, pp. 135–144,March 1999.